AJT Equipment is pleased to announce that Chain and Rope Suppliers and Hoistech are AJT’s sole representative for the Island of Ireland offering sales service and support for the AJT range of load cells. AJT like Chain and Rope Suppliers and Hoistech is a house hold name in the lifting gear and hoist equipment supply industry. 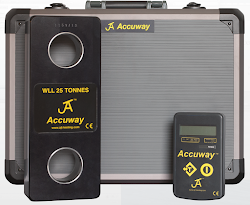 Their range of load cells are the load cell of choice right across the industry due to their accuracy, reliability, price, usability and unrivalled customer service.